All the Tea in Canton: Chengdu: deuxième partie. Term is over but the young and amorous linger with an edifying nonchalance. Indeed, Chinese provincial students have a way of carrying themselves with an understated grace I can scarcely define: sweet and bespectacled, they stroll in pairs with careless poise, monotonously innocent yet ineffably urbane. I marvel at the ease with which they browse – content to peruse back-issues of Agrarian Reader’s Digest whilst sipping tins of saccharine iced tea. To my left a bicycle rickshaw paddles along the dusty, tree-lined pedestrian thoroughfare with the only plumpkin I’ve seen in days. The air smells of pollen and petrol yet hums with an elusive virility. As in most Chinese metropolises, the sun’s not wont to show its face – but today, for some reason, she’s cast a sheet-like spell of monolithic fulgor over all of campus. Amber flashes shoot through ancient oaks like bullets through water; one is hard pressed to spot a placidly adorable pupil without parasol in hand. A favorite writer of mine once castigated the Japanese for absorbing but the most desultory aspects of Western culture – imperialism, hedonism, consumerism – while rejecting its countervailing qualities – creative expression, reason, romanticism, redemption – to name but a few. While I cannot verify his statement (just yet), the inverse might be said of the Chinese Provincial University, namely that it’s absorbed the better surface aspects of the Western Research University – academic rigor, scholarship, socio-economic leveling and a seeming modicum of communal socialization – whilst rejecting the less noble virtues of American Higher Education – debauchery, misogyny, (intellectual) apathy – to name but a few. Of course, for all I know their stoically studious countenance collapses behind closed doors, leaving them prostrate before an altar of Angry Birds; I’ve no way to say. On the momentary surface, however, one is left with the sweetest image of a cheerful, timeless academic piety. It is Sunday so we head for brunch at the only American joint in town. Immediately we’re amongst 40% of the expat scene, a typical mélange of teachers, NGO workers, oil consultants and consular diplomats. When word of the Wang Lijun incident had first been leaked to the New York Times – leading to China’s largest political maelstrom since Tiananmen – it was reckoned to have been leaked in this very establishment. In a city of 14m, Western journalists only convene at two locales. One of my lovely hosts, a Fulbrighter poking through the world of Great Unknown Chinese Fracking, had been evading a Times reporter lurking about the diner all that week: all too often our window on the world is but a window. To my great dismay Paddy and Vermont Dan get cocktails – but stick with drip I must. We tip the friendly, heavy-set Chicagoan and set off for the tea gardens, Chengdu’s most illustrious attraction. Whereas People’s Square in Shanghai is an acclamation of Chinese modernism with an eye for historical flare, its equivalent in Chengdu is an unadulterated ode to the imperial past. The Red Guards may have taken down the great walls of the city with a whimsical nod from Mao, but the gardens within the Square retain all the cultural splendor of ere. The entrance to the park was somewhat insignificant but once inside a world of subdued splendor meets the eye. Stands selling brightly woven demi-gods float from cracked-wooden hangers in the afternoon heat, while skewers of barbecued lamb scatter mouth-watering aromas into the air. In each opening, elderly tai-chisters bob and weave to the remembrance of things past. Beyond the opening, where the willows resume, the 40- and 50-somethings congregate to peruse the public marriage proposals posted along a wooden fence like inquiries from American doctoral students in every épicerie on the Left Bank. I could make out nothing of the Chinese characters, but was told that below the unassuming photo of each young, procreationally-aspiring man was an all-too-unambiguous listing of his age, profession, salary, education and, finally, name. For all our touted American pragmatism I suppose they’re better at cutting to the chase than we. Bride-grooms aside, we made for the Mahjong tables, where the real magic occurs. In a shaded piazza of low-flung tables, endless clusters of Chinese men and women – always separated by gender – sip tea, banter and strategize the afternoon away with the Chinese predecessor to Rummikub – often in wildly varying stages of mirth and ire, and always for money. We take a table of our own and begin the draw. Within a match, we’ve three lookers-on, each keen to gauge whitey’s strategic acumen – and each scheming to hold the balance of power amongst us like Lord Liverpool in the age of Napoleon. The moment one of us pulled ahead, they’d seize upon a neighboring apprentice, whispering, quite literally, sweet nothings into his ear to effect a change of course. In the end, we roughly split games – though not before several hearts, dare I say reputations, were mildly tarnished along the way. The proceeding nights and days unfold with delicious uniformity. Upon awakening, one saunters down the lazily bustling avenue bordering campus. Motley local delicacies await: Uighur spicy noodles; piping-fresh Tibetan samosas; Sichuan-peppered delights of every sizzling variety. First, however, we must make for the art-house café on the other edge of the Kingdom. What appears an old military canteen is in fact a massive, kaleidoscopic collection of cultural artifacts, both Chinese and Western, gathered in arguably the best café I’ve been to. Red bicycles, broken clocks, statues of Mao and Marylyn grace the flower-laden, daisy-cloth donning tables at every turn. The waitresses don unassuming bangs (as most good Chinese girls currently do) and don’t let off they understand English. The Americano is giant, strong and expensive – the ash tray overflowing. We only know of the aforementioned because an old friend was until recently on duty at the American Consulate. 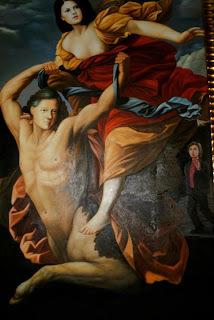 Mining the hotel in the days before a Biden state visit, Secret Service had stumbled upon the quasi-hidden painting. Whilst they could hardly reveal it to a democratic VP (which I no doubt hope and trust they did), it became something of a legend in the hearts and minds of those lucky enough to stumble upon it via word of mouth. According to legend, it was a personal gift the hotel’s proprietor simply could not refuse: hence the clandestine location where he hung it. An incredibly subversive political gesture or merely poor taste? I suspect the distinction is less stark than many are loath to admit. The days amble by, then, with a carefully measured insouciance. One strolls the boulevard and the back-way, nibbling on street-food and stopping off for tea. We make several trips to varying ‘urban reconstructions,’ zones of ‘ancient renewal’ where Han Chinese tourists go to unload their wallets and feel at home in both the contemporary architectural wasteland that is most of urban China and simultaneously relish their own historical legacy. Of what do I speak, you must surely be asking yourself. Imagine, as it were, the Bavarian castle at Disneyworld, the neo-Gothic spires of recent American universities: we New Worlders haven’t a monopoly on historical-architectural appropriation. Nay, the Chinese, despite their no doubt recurrent taste for reconstructing Bruges along the Yangtze, have an even deeper reverence for their own architectural past. And all over Sichuan they’re building living, breathing replicas of entire ancient neighborhoods – and then filling them with merchants of caffeine and corn-on-the-cob. A tragedy? Not quite. These recreations are deeply attractive and seem architecturally sound. Given New Money’s urge to dwell upon a cultural achievement of its own, these commercial communities are also likely to have been built with far higher standards than many of the make-shift schools that imploded without resistance in the earthquake that ravaged Sichuan province in 2008.